The Ariana Institute for Wellness Education offers an outstanding resource for those interested in medical massage therapies, featuring topics that include Headache and Allergy Relief, Lymphatic Massage, HIV/AIDS Information for Massage Therapists, Pain Management, Prenatal Massage, and Geriatric Massage. The Ariana Institute’s Medical Massage Therapy Manual is part of a series of massage manuals that are designed to help deepen the knowledge and understanding of current massage therapists and introduce new, upcoming massage therapists to the world of massage and bodywork. To order your copies of the Ariana Institute’s Medical Massage Therapy Manual visit www.amazon.com/author/arianavincent. 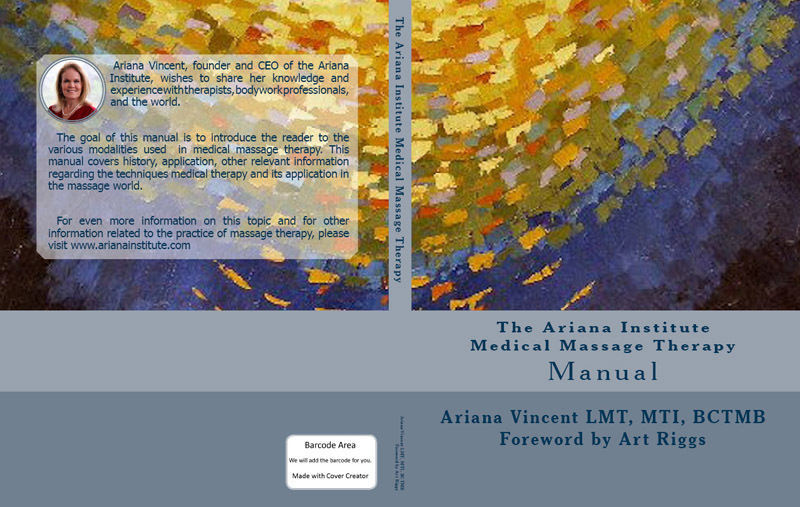 This manual incorporates detailed protocol descriptions, high definition instructional photos, links to the Ariana Institute’s online instructional videos demonstrating a wide variety of techniques, marketing and practice building strategies, and resources for advanced learning to encourage a comprehensive understanding of medical therapy modalities that can be offered in a massage practice. The Ariana Institute’s therapy manual series has been over 16 years in the making and is a monumental achievement for the Ariana Institute. The Medical Massage Therapy Manual is a perfect source of deep study for massage therapists and those seeking to expand their understanding of medical massage therapies and further cultivate their practices! Here is the foreword to the Ariana Institute’s Medical Massage Therapy Manual by Art Riggs, Certified Advanced Rolfer and Massage Therapy Instructor. Over the last fifty or sixty years massage and bodywork has grown from an ungainly infant of a few practitioners performing primarily relaxation massage as an avocation, for recreation or personal growth to a profession of at least late adolescence and maybe even early adulthood. Today, massage therapy has matured to a respected and economically viable profession. Some large sample polls find that the public often chooses massage over chiropractic, physical therapy, medication and other classic western (and Eastern) modalities for a large list of complaints including back and neck pain, headaches, working with adhesions, lymph and other residual effects of surgery, geriatric, and serious illness such as HIV and cancer. However, this success has come with a price. I see a divisiveness as different modalities—from myofascial, neurological, movement work, trigger point, cranial sacral, structural integration, orthopedic massage, and a host of others vie for dominance, often competing with or even denigrating other forms of bodywork. As is always the case when success brings money, big business has seized the opportunity to enter into all aspects of massage and bodywork. Competing professional groups vie for accreditation and liability insurance; large trade schools churn out huge numbers of competing therapists with spa-oriented training providing minimal training in how to deal with the physical issues our clients are looking for help with. Small wonder that the attrition rate is high in production line fifty minute massages as burnout, injuries, and disillusionment result, both from overwork in corporate employment and from a lack of deep personal gratification that comes from feelings of efficacy in improving peoples’ lives with valuable therapeutic work. For various reasons, often because of lawyer imposed strict limitations on scope of practice, a great many excellent therapists working in spas have an arm tied behind their backs, limited to doing cookie cutter “relaxation” massages with strict rules to refrain from working with any “conditions” or injuries that their clients present. The largest complaint from the public is that the therapist did not listen to or address their complaints. Although this may be because of limitations imposed by their employer, many therapists admit that they have scant training in dealing with complaints and injuries that fall under the scope of therapeutic or medical massage. It saddens me that so many of these therapists have no idea of how much help they can be to the health of their clients and the feelings of fulfillment that come from such work. The reality is that virtually every client, no matter what kind of work you do, will have a need to address a wide range of conditions, from improved athletic performance, nagging injuries or pain, better mobility or posture to more serious medical conditions that can be addressed in even the most soothing relaxation massage. To excel in massage and separate yourself from the masses to build a successful following, as well as to add the gratification from interesting and downright fun problem solving and the gratitude of clients, it is almost a necessity to have therapeutic healing skills. As bodywork has ascended to mainstream therapy “therapeutic” or “medical” massage training has blossomed, and this has moved our profession from counter culture to mainstream. However, it can be quite confusing to decide what direction to take in studying and practicing. One of my favorite teachers often reminded his students, “Give a man a hammer, and the whole world becomes a nail” as a caveat against simplistic and myopic panaceas for treatment. However it is common for therapists of different modalities to tout the superiority of their work, and sometimes as a group, denigrate other forms of work as insignificant or ineffective. So what is a therapist to do in what should be a life-long quest for increasing knowledge and effective and gratifying therapeutic skills? Rather than narrow protocols or trainings with fancy names, I love the multi-dimensional approach of Ariana Vincent. Ariana is a highly skilled practitioner with a wide range and deep understanding of eclectic modalities and has been a major force in bodywork for more than 30 years. She has trained in and taught many different forms of bodywork, and has a wealth of wisdom—both technical and philosophical. 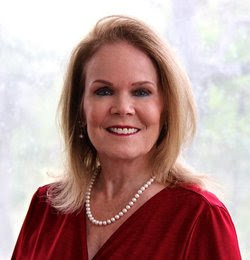 It is no surprise that she has been included in the Massage Therapists’ Hall of Fame for her contributions to our field. Her new series of manuals, videos, and classes provide the skills to successfully work with confidence with a wide range of conditions and will be a great aid to all levels of practitioners. Many therapists are fearful to work on many conditions that could be greatly improved with an educated touch but are intimidated from taking advanced trainings that appear too clinical or complex. Life is rarely as simple as the advertisement and hype that some advanced trainings advertise to draw students. This approach gives the simplistic and false impression that there is some magic bullet to cure all ills. Of course we all would love to dramatically improve many conditions or complaints, but much of the skill of working with injuries or medical massage is the ability to let go of outcome and simply work around injuries with many of the associated components such as compensatory holding and fear. Ariana’s training offers, not only nut and bolts techniques to treat and improve a host of issues, but also the invaluable skill to “work around” many conditions safely to restore balance to the body and mind instead of simply working myopically chasing pain. Rather than demonstrating rigid protocols, in the Ariana Institute’s Medical Massage Manual and her accompanying classes Ariana goes into great depth in giving an understanding of a wide range of conditions and a multitude of techniques for your toolbox to work with confidence with these conditions. No book is a substitute for hands on training, but Ariana’s series also offers the invaluable gift of high quality videos to see the work performed in real time. This will give anyone immediate tools and the confidence to give excellent help to anyone. I love that her training can dovetail with important relaxation massage rather than attempting to be too technical or an attempt to provide physical therapy. Many therapists who take advanced classes say that they love the techniques but are stymied by how to transition into a somewhat “limited” practice of medical massage. I particularly like that Ariana’s series of massage manuals can work in both directions: Practitioners, including those working in spas, who do nurturing relaxation work can immediately begin including these strategies into their massages. Conversely, clinical therapists who may feel limited by strict protocols from advanced trainings will be able to add a wide array of valuable ancillary techniques to match the individual needs of each client. The Ariana Institute’s video introduction to the Lymphatic Massage, Headache and Allergy Relief, Pain Management, Prenatal Massage, and Geriatric Massage CE courses can be accessed below or on the Ariana Institute’s YouTube Channel at www.youtube.com/user/ArianaInstitute. To order your copies of the Ariana Institute’s Medical Massage Therapy Manual visit www.amazon.com/author/arianavincent. For additional information about the Ariana Institute and to register for online continuing education courses visit www.arianainstitute.com/ce-online/.